Our first stop was in the Moretown Formation. 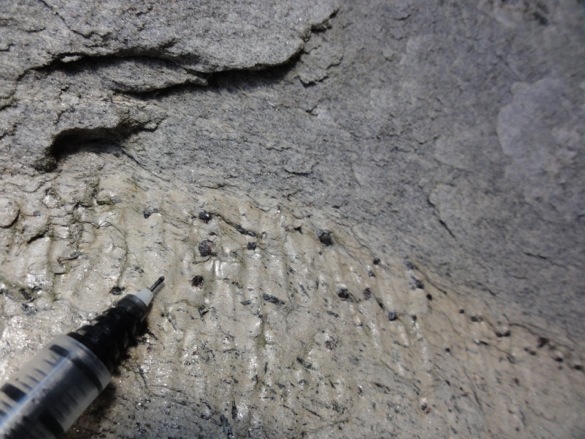 These early Paleozoic rocks were originally deposited on the edge of the continent and were subsequently deformed during the Taconic and (perhaps) the Acadian Orogenies. The outcrop consisted of interbedded schist and quartzite that had been metamorphosed to upper greenschist – lower amphibolite facies. 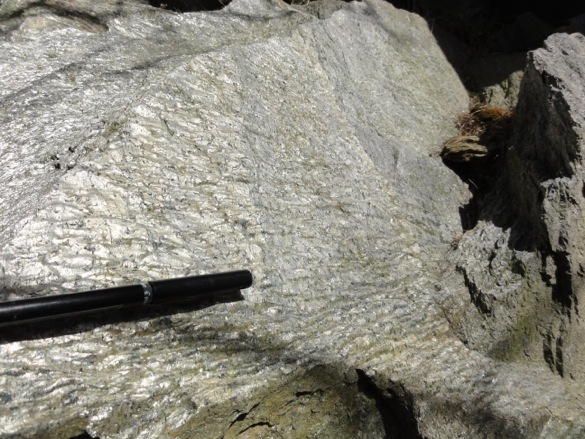 We observed tight folds that showed fantastic crenulation cleavage, which developed as a result of multiple folding events. Side-view of the crenulation cleavage, almost looking down the cleavage crenulation hinge. 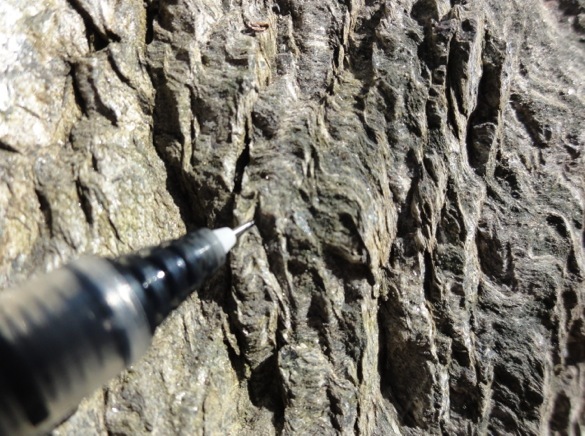 The light reflects off of the wavy surface of micaceous schist layers. The pen is nearly aligned with the cleavage crenulation hinge. Garnet porphyroblasts in the Moretown Formation. After a brief stop at the Yankee Candle Company (what’s not to like about hot coffee, clean restrooms, and plentiful scented candles? ), we made our way to Mt. Sugarloaf. Here, we visited the type locality for the Triassic Sugarloaf Arkose, a feldspar-rich sandstone and matrix-supported conglomerate. The arkose was deposited in the Deerfield rift basin during the opening of the Atlantic. Abundant orthoclase suggests that the sediment was close to its source. 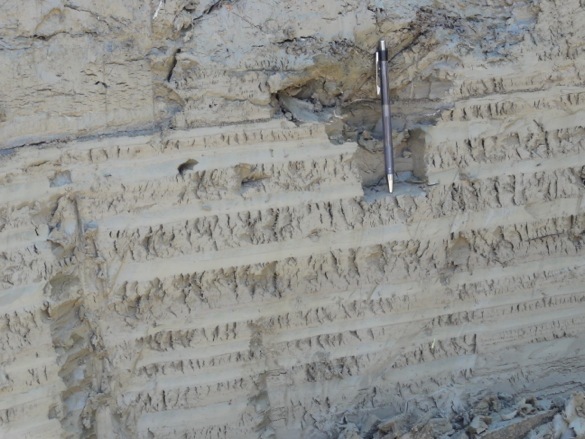 Most of the sediment was deposited by debris flows, but there is some evidence for reworking by a braided stream system. 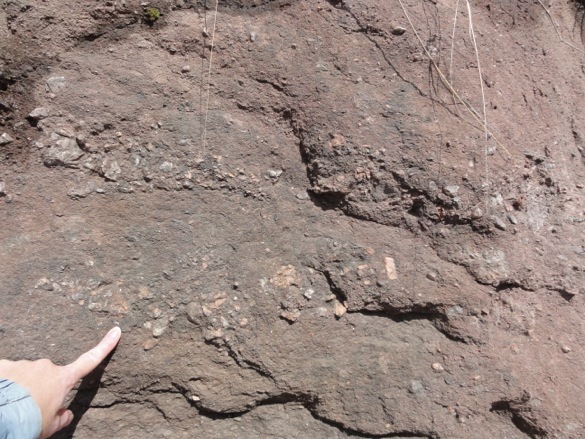 Conglomeratic section of the Sugarloaf arkose. We hiked to the top of Mt. Sugarloaf for a scenic lunch stop, where we had a breathtaking view of the Mesozoic rift valley in which the Sugarloaf arkose was deposited. View from the top of Mt. Sugarloaf. After lunch, we traveled back to 15,000 years ago, when the rift valley was filled with proglacial lake Hitchcock. The lake was over 200 km long, stretching from upstate Vermont to central Connecticut. 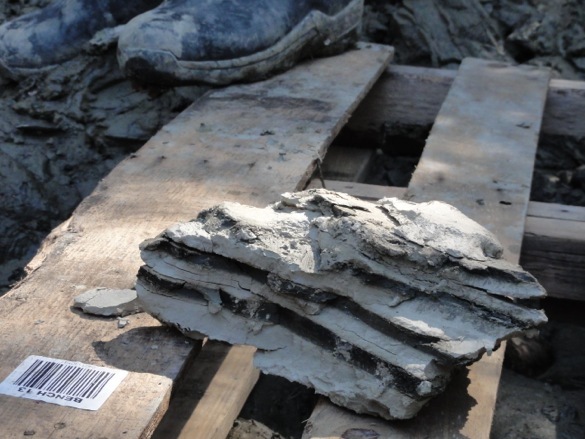 Seasonal layers of silt and clay were deposited on the lake bottom, forming varves. It’s the flat-lying varves that make the valley floor so flat. The annual layers were also critical in the development of the New England Varve Chronology, which suggest that the lake existed for over 4,000 years. Close-up view of the annual layers in the Lake Hitchcock varves. Our last stop of the day was to see the trace fossil Eubrontes (aka dinosaur footprints). The three-toed tracks are subparallel. If the tracks are the same age, then they may have recorded a passing herd. If the tracks are on different bedding planes, then this area may have been on a migration route. The Amherst College Beneski Museum of Natural History hosts the largest collection of dinosaur tracks world, primarily collected by Edward Hitchcock (also of the proglacial lake, third president of Amherst College, 1845-1854). 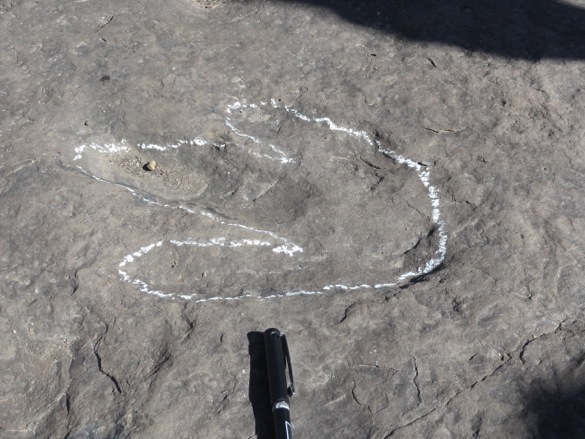 Three-toed dinosaur footprint. Do you see it? 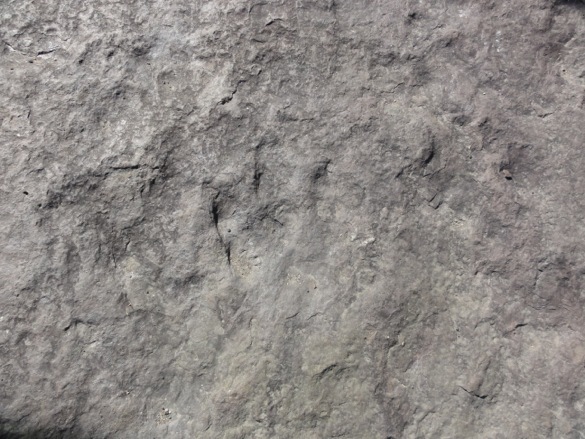 It was nice of the dinosaurs to outline their footprints in chalk to make it easier for us to see! We finished the evening with a reception at the museum (a drool-worthy collection that will be the focus of a future post). After a quick pizza dinner, the Iceland group is meeting for the last time to work on tomorrow’s presentations. It’s a bittersweet meeting; it’s fun to bring everyone together to compare findings and pat ourselves on our backs for a job well done, but it’s a bit sad to know that our Keck experience is coming to an end. 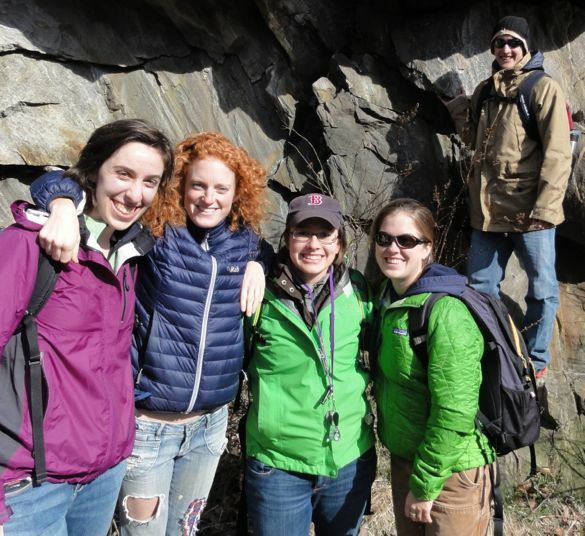 The Iceland crew on the Keck Field Trip.